I can't stop thinking about this dining room that I found on Redneck Modern. My parents recently bought a mid century house with an awesome view, but like many mid century homes it needs some love. Despite the fact that more than half of the exterior walls are glass curtain walls, all the original wood makes it feel dark. That's why I think Bret and Mary Peyton's home makes perfect inspiration. 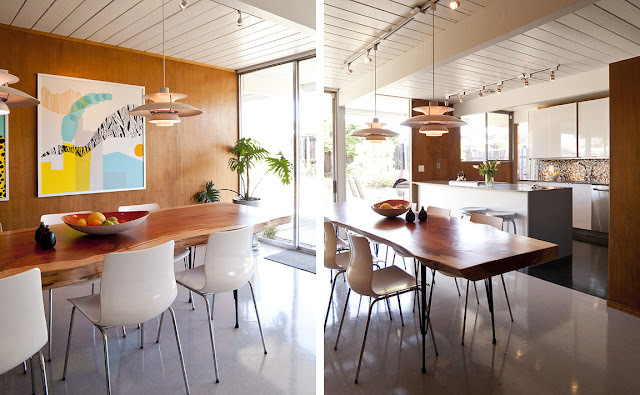 They successfully balanced the rich wood paneling with clean shiny whites and bright pops of color. Love the art, by the way. Just perfect. 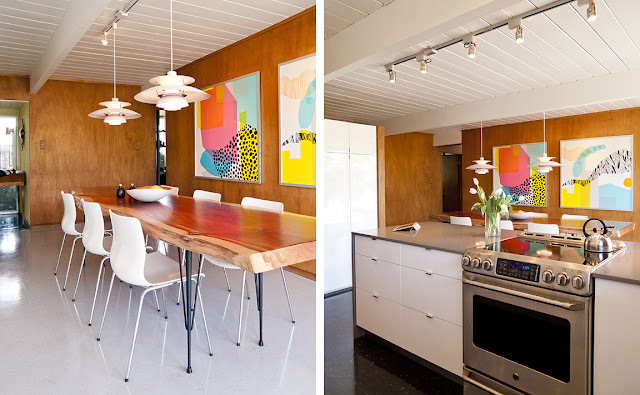 Originally found thanks to Design Milk's Pinterest. The art is actually Marimekko fabric, very nicely framed! Do you know the name of the Marimekko fabric? were can I get the same as shown in the picture? I am in love with fabric !!! !